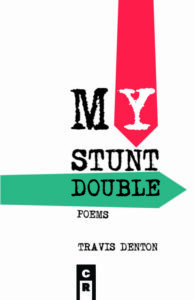 Travis Denton’s third poetry collection, My Stunt Double, is intricate and ambitious, an excellent fusion of narrative and lyric. Denton creates a world enriched with events that are both natural and surrealistic, cataloguing memories that present a full spectrum of personal experience. In this world, balloons suddenly fall from the sky, cicadas burst up from the ground, and lovers visit the moon. In this carefully constructed universe anything is possible — a road trip to the West or the apocalypse. My Stunt Double is a strong step forward for Denton; the poems are compressed and harmonized, full of precise language and sensory detail. The sharpness of detail increases as the poem zooms in on clowns who attempt to tie the balloons “into poodle with bone, / long sword or crown….” It is also discovered that the balloons contain messages and fortunes, but the most surprising moment is the lyrical ending. The balloons bring people together. The streets become “…full of goodwill, / Everyone past questioning the source, / but shaking hands…” in order “To repair a bygone rift, to make right, / To give thanks and to sing.” The ending, although highly utopian, is fitting for a collection like this which is dedicated to hopefulness and wonderment in a manufactured, suburbanized world. Readers learn that this is a dangerous job for any human being, not just a teenage boy: “I wore those gloves because they said / The sandblast would strip my hand to bone / In under two seconds…,” but more importantly, this is where the irony of the poem surfaces. Although the stunt double performs impressive feats, they are ultimately flashy. He functions as a glamorous reflection of the speaker, but is unable to stand-in for moments of real pain: “My job was to blast / The plaster from the art, / while the smell of my own breath and sweat / Made me sick, balancing on two feet / Of shifting sand as tablesful of work / Stared me down.” The speaker quits the job and the band, but not the stunt double, who is more of a problem than a solution: “Hungover for six straight days, / Cigarette dangling from his lips— / Dodged a Plymouth and ran back / Into a life I still do not know.” The speaker’s vulnerable admission intensifies the ending moment of the poem, making this one of the most complex poems of the collection. Your windows shudder under the weight of it all. Your car pushes itself out of the drive. Head, melody, solo, repeat, repeat. Andrea Syzdek earned her MFA in Poetry from the University of Houston in 2017. Her reviews have appeared in Pleiades, Kenyon Review Online and Harvard Review. She currently lives in Hockley, Texas. Web: andreasyzdek.com. Twitter: @andrea_syzdek.